Thought I would make one last dump of photos, just to keep you in the Halloween mood. Seems I am one photo shy of the full 33 count, but I’m not taking the time to try to find the missing quilt. Al of the quilts that were not given away in the initial batch are on their way to new homes, reaching them before the 31st, I hope. Am now in the process of developing a new pattern for kits for the Children’s Quilt Project. Many members of EBHQ have indicated that they would like some variety, and after making so many of these usual quilt pattern (most of the ones shown in these photos above), I can understand how it might be time for something completely different. Anyone have any idea to suggest? Five new ones; just can’t stop making them. This brings the total to 33. I’m still amazed that working on these donation quilts helps keep me working on my personal projects that may have been stalled for various reasons. And I’m equally pleased that I can still stomach the color orange. Perhaps this, too, is a major part of the lesson of my Halloween quilt exercises: orange, in all its shades, hues, and intensities, is a wonderfully versatile color. I have already been asked whether I will switch to Christmas fabric and make an equal number of quilts. I admit to having an unnatural fixation on Christmas fabric as well, but after the Halloween series, I’m currently trying to take a break from obsession. 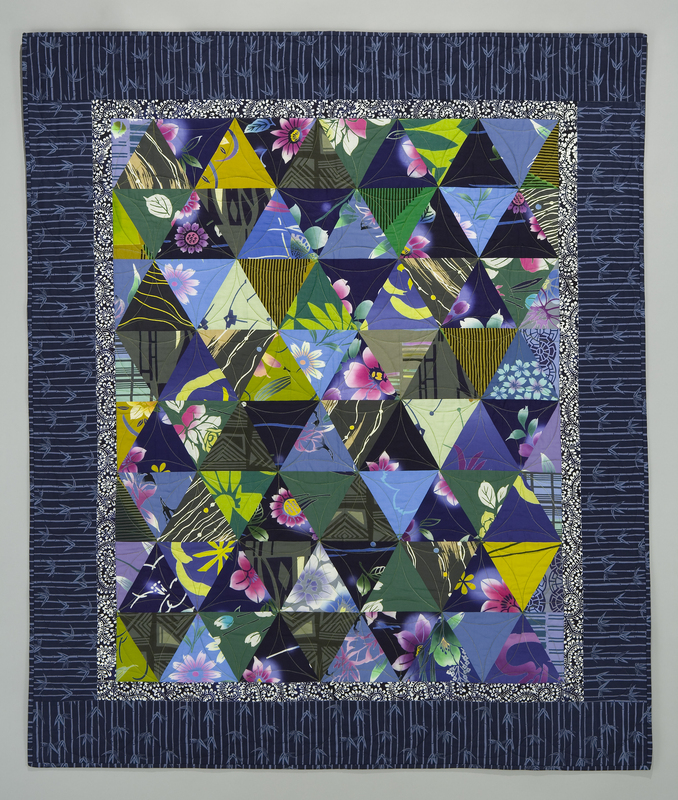 This quilt is the most recent in a larger series of 100 Pyramids quilts. I have made a lot of these quilts (don’t make me start counting stuff right now), and each one offers the opportunity to show off wonderful fabrics, especially the large-scale ones. As each triangle finds it’s place, additional patterns begin to develop on the quilt’s surface. I began the series in 2004 at a retreat at Asilomar. I wanted to develop a pattern for a quilt that would showcase my pile of Japanese yukata fabrics that I had collected over the years, mainly from Kasuri Dyeworks, when they had a retail store here in Berkeley. I also wanted to use the works of friend and New York artist Hitoshi Nakazato as an inspiration. Some of my favorite works of his were prints and paintings that included large geometric shapes playing in open spaces. So I drafted my large triangle (equilateral, with a base of 7-1/2 inches) and started playing. The first in the series looked like this, and was gifted as a graduation quilt in 2007 to a member of my daughter’s community service group. And then there came the next Pyramid variation for Blythe Vaccaro when she graduated UC Santa Cruz. By now, I have begun to love this pattern and the great fabrics one can use for it. Now it was time for beginning the daunting task of actually cutting the Japanese fabrics. I LOVE the finished quilt. It was one of those projects that seemed to make itself. Cut fabric to laid out design took less than a day. I’m sure there will be more of these in the future. When you make yours, let me know and I will post pics here. 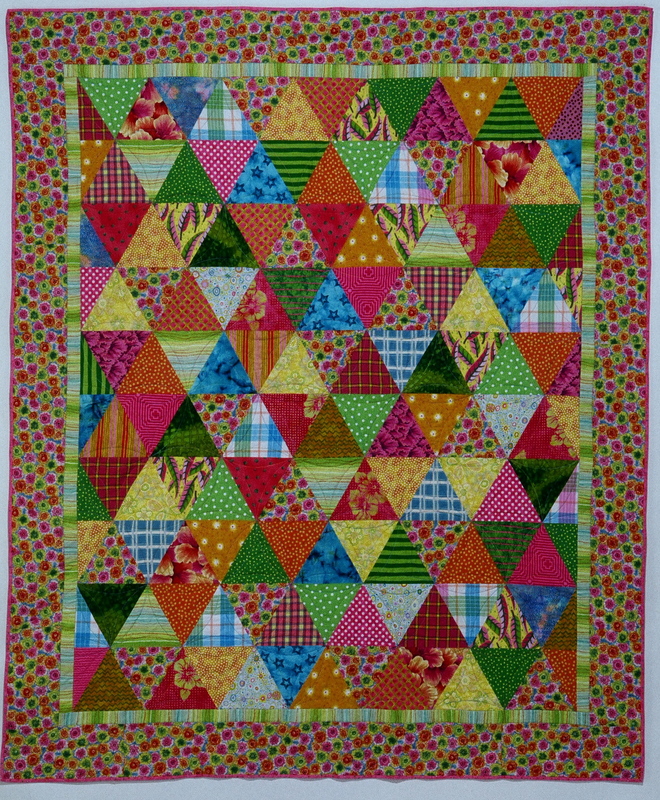 This quilt is another in the Four Patch with Half-Square Triangles family. It’s very interesting to me how this extremely simple block pattern can look dramatically different when using a wide variety of fabrics. And here’s another. These fabrics were so fun to look at and get a chance to show themselves off in these simple quilts. After you have cut what seems like a thousand of these squares and triangles and put together a lot of quilt kits, there are shapes left over, which of course one cannot discard!!! Waste not, want not—the most basic quilting motto EVER!! I guess I can keep doing this forever. I’m still just a little bit hooked. This quilt pattern is one of the basics used by the Children’s Quilt Project for their quilts. When I started cutting the Halloween fabric from the two boxes, I cut many, many of these standard triangles, squares and border strips and then began putting them together into groups, just like working a huge fabric puzzle. This is the process that got me hooked. And, for now, just one more. I never know what I am supposed to learn from any of these fixations that I get, but I think one of the lessons here was acquiring organizational abilities and teaching myself speed sewing techniques. I thought I worked quickly before I started this. I’m much more efficient now. Note to self: Get a better camera for in the studio.